If you’re in business and also a Facebook page admin, you’ve no doubt been tempted by the Boost Post button on your Facebook posts. It’s easy to hit that blue button with the promise of reaching thousands of people, for just a few dollars. The reality is that this option rarely results in the outcome you’re after. It’s a quick way for Facebook to make a few dollars but it’s not what a professional would use to generate sales, leads or whatever else your goal might be. If done correctly, social media marketing can generate tremendous results. You just need to follow a few basic steps and you’re on the way to doing Facebook ads like an agency. 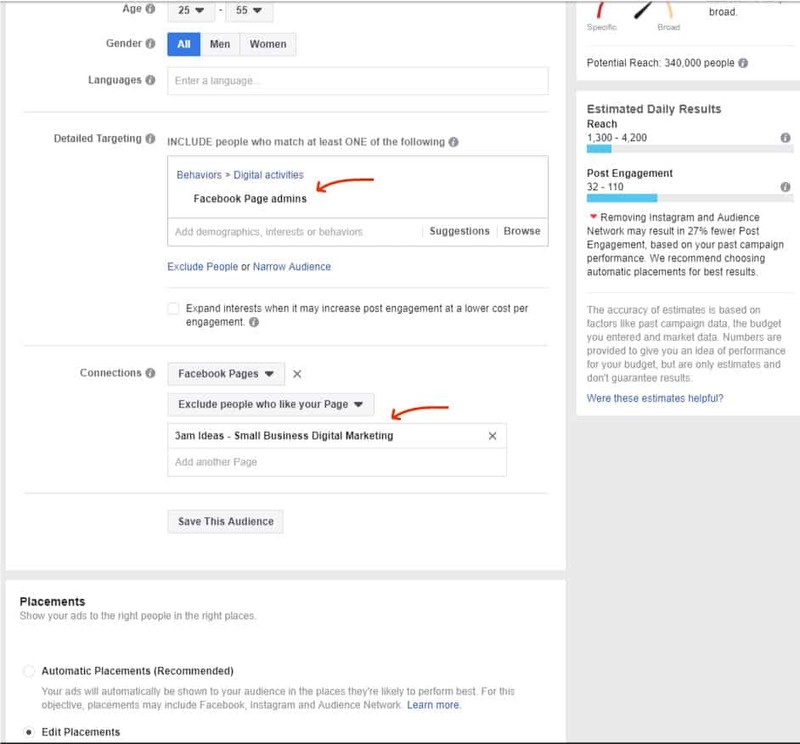 Read on for a simple step-by-step guide on how to set up a Facebook advertisement like a pro. It is absolutely essential for the following steps that you have Facebook Business Manager already set up. You will also need to have created your ad account and, ideally, have a Facebook pixel installed on your website. If you haven’t done this already and need help on how to do that part, simply check out our previous post on this topic. If you’re already properly setup, then proceed to Step 2. There are three levels to every Facebook advertising campaign. These are divided by the following names “Campaign”, your top layer, “Ad Set”, the middle layer, and “Ad” the bottom and final layer. 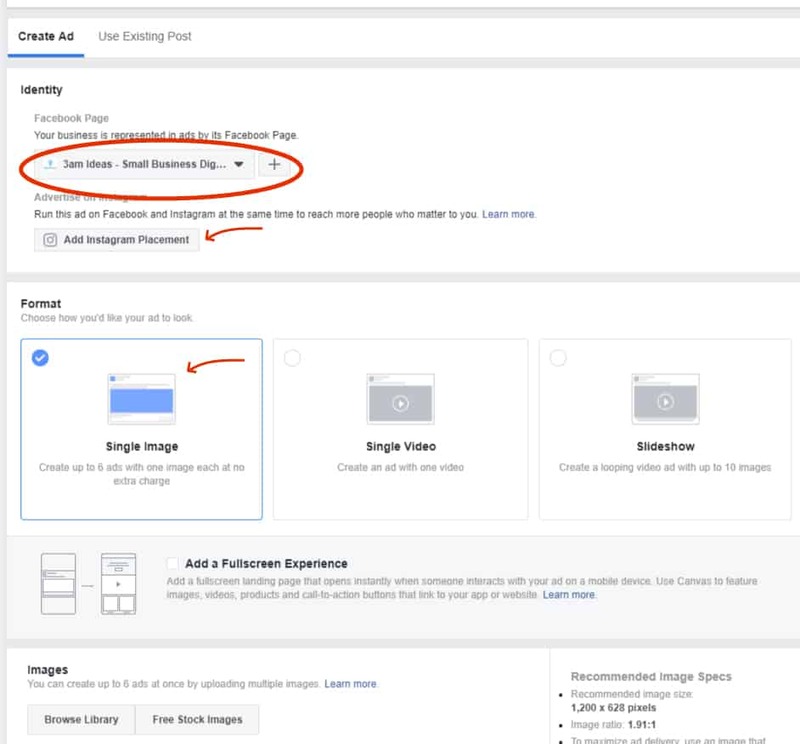 To get started, in your Facebook Business Manager, navigate to Ads Manager and select the green button that says “+ Create” (Figure 1) to create a campaign. Your choices in the campaign menu let you identify your overall desired outcome, Facebook will strive to fulfil this goal for you. 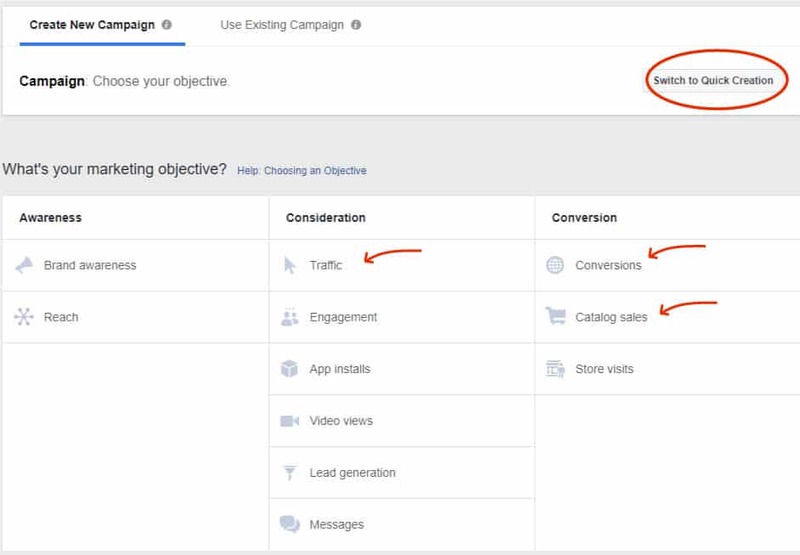 Just make sure here that you’re using “Guided Creation” not the “Quick Creation” way of building your Facebook campaign (Figure 2). You’re now presented with a number of marketing objectives. It is important to note that there is no way of cheating Facebook, hacking the system or finding loopholes. It is crucial that you are as honest in your creation as possible. So if you’re after more website traffic, pick “Traffic” for your desired outcome. If you want more sales on your eCommerce store, then you should pick either “Conversions” or “Catalog Sales. For our case, we really just want to show to our audience this blog post you’re reading now, and to get them talking about it. We will be picking “Engagement” as our objective (Figure 3). This is commonly referred to as a PPE campaign. You’ll often hear the eCommerce Youtubers talking about it. 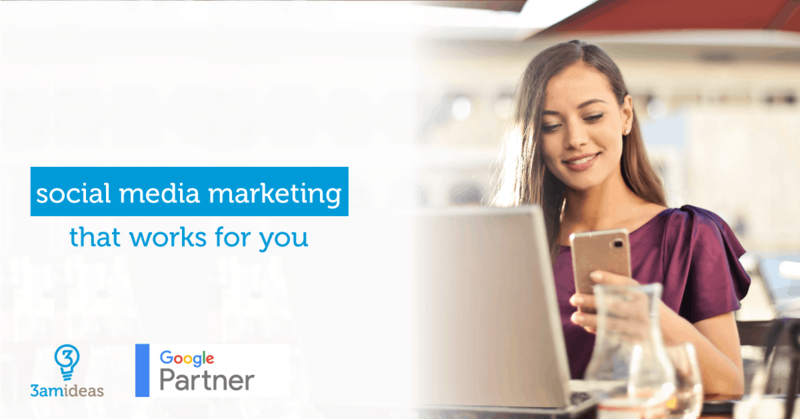 And of course, don’t forget to name your campaign something you’ll easily recognise in whatever suite you’re using to track your digital marketing. Your “Ad Set” is all about configuring the delivery of your adverts. Here you will be picking your targeting options, your budget, and scheduling. Let’s go through it one by one. Leave the naming of the ad set for now, we will come back to this. Continuing with the promotion of this blog post, we’ve decided to only target our home state of Western Australia. We are only interested in business owners who live in WA, so we will be reducing our audience size by picking “People who live in this location”. This leaves out any tourists or travellers to the area (Figure 4). 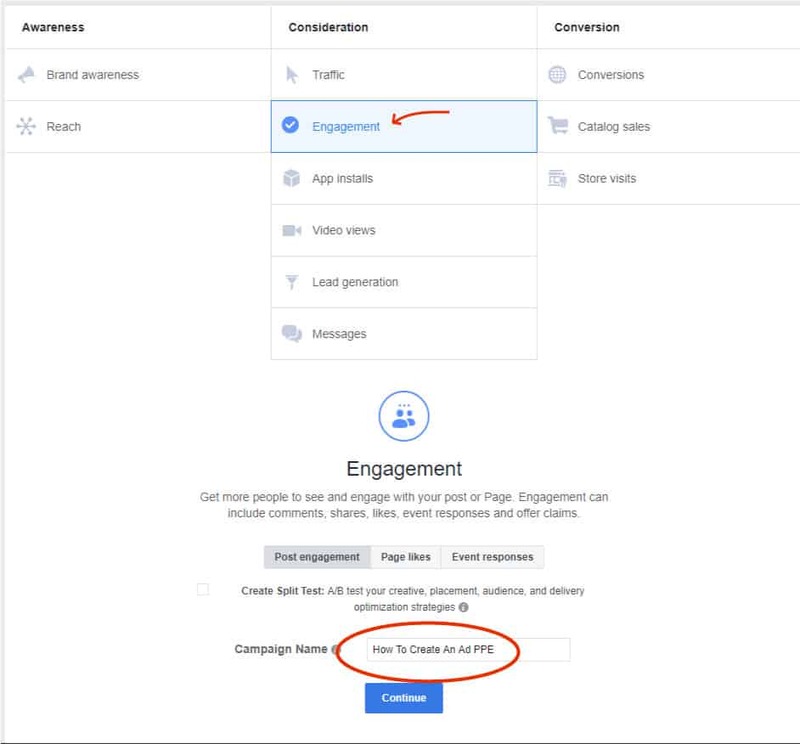 You can now further reduce your audience size by fine-tuning your targeting with interest-based or “Detailed Targeting” (Figure 5). We will be picking all of the “Facebook page admins” to narrow our audience. We will also be excluding anybody who already likes our Facebook page. The article will be posted on our Facebook page so any followers should already see it. Figure 6 will show you your audience placement and budget. We’ve unselected each placement option except for “Facebook Feed”. Feel free to experiment with these options, there is no one perfect way to set up your social media marketing. It’s all about split testing. Finally, we have selected a budget of $5/day. For any serious testing, we recommend at least $10/day for the first week. Your objective here is to buy visitor data from Facebook, the longer you wait the longer it takes to find profitable audiences. Now that you’re done with setting up your Ad Set, go back to the top and rename it. We recommend naming it after the targeting options you’ve just selected. 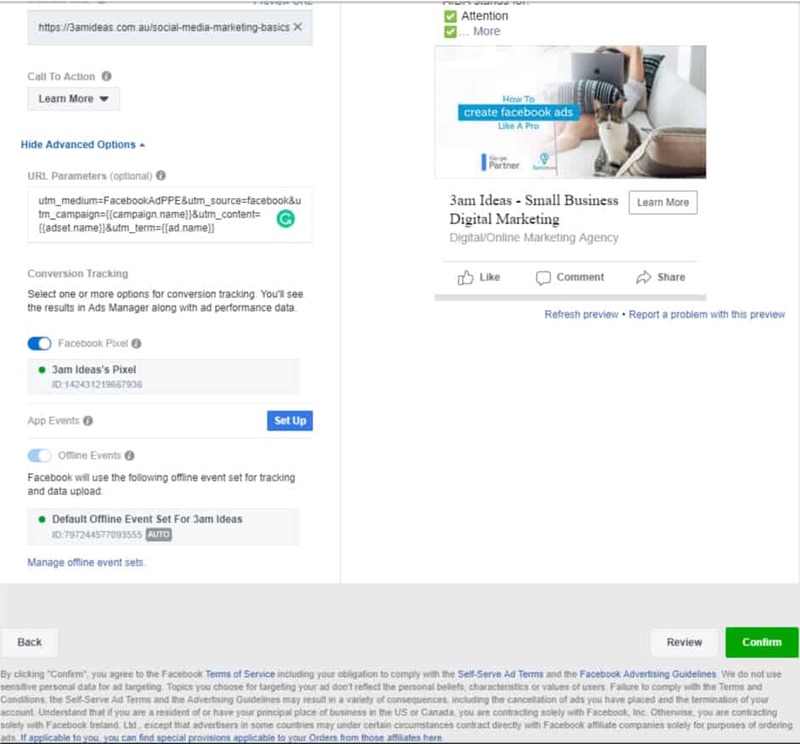 We’re naming ours “FB Page Admins – 25-55 – $5”, this will quickly tell us later what this particular Ad Set is all about, without having to open it back up and looking. Finally, we’ve come to creating your Facebook ad. On this screen, you’re choosing artwork, ad copy (or text), and whether you’re serving video content, an image, or a collection of images. You’ve carefully spent time finding your audience in your Ad Set, give just as much care to having proper artwork. Again, leave naming the Ad until later. 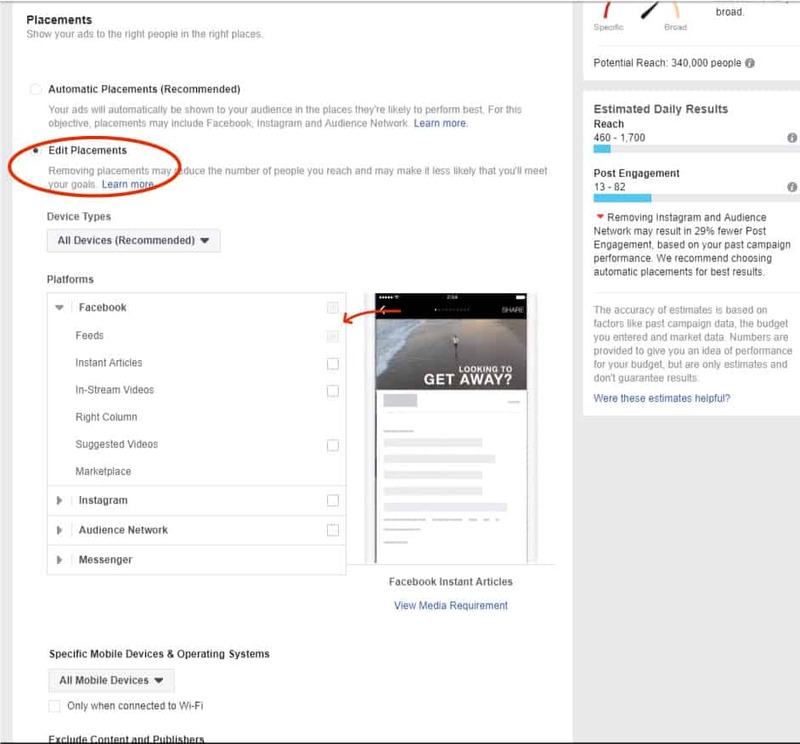 Pick your Facebook Page, and Instagram account if you’ve chosen to place your ads there, and your preferred ad format. Video is definitely king at the moment, but we’ll be going with just a single image (Figure 7) as that’s the media we have available. Next, upload the artwork you’ve created. Your ideal image size here is 1200px x 628px according to Facebook. We have experimented with square images as well and often get a better response on those. Again, just split test your way through your campaign. We’re using a couple of different layouts for our Facebook advert. IMPORTANT TO NOTE!!! You should always create more than one ad at a time. Try using different imagery, different ad copy and call to action statements. 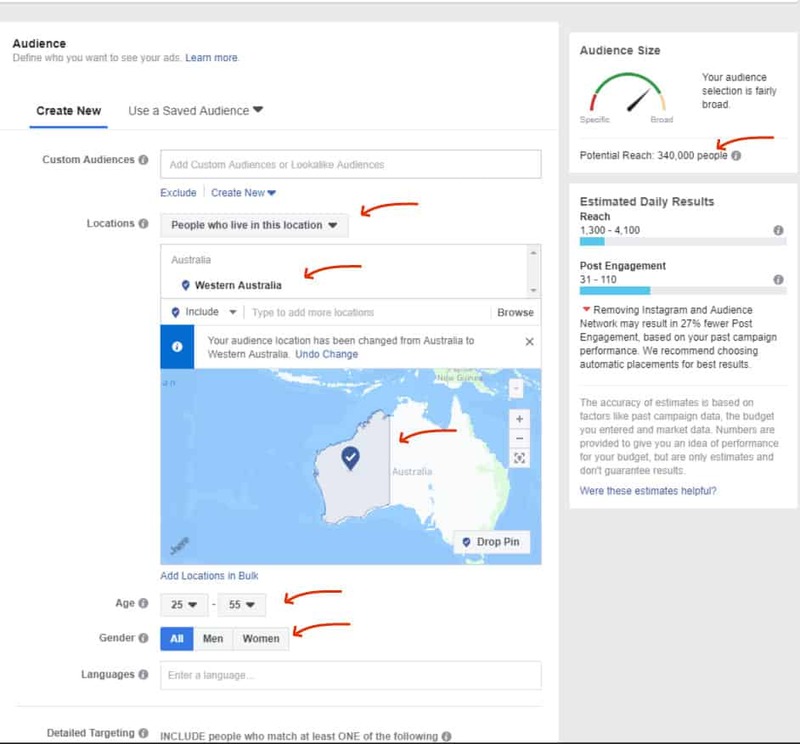 Let your audience pick the ad they prefer the most, identify it through your analytics and kill off the non-performing ads after about a week. 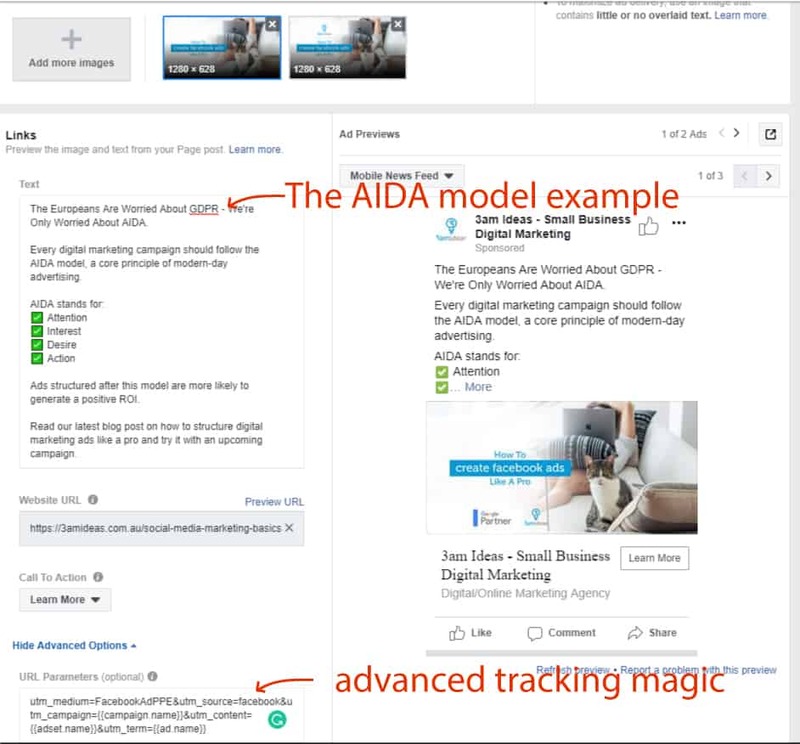 When it comes to writing high-quality social media marketing ads, you want to start writing with the AIDA model in mind. This acronym stands for attention, interest, desire, and action. Use your own way of wording the advert, but follow the AIDA structure, a quick example we’re using is in Figure 8. Follow this process and you’re on the way to writing compelling and engaging social media marketing copy while keeping with your brand’s unique online voice. Lastly, return to the top, rename your ad to something you’ll recognise in your tracking, and you’re done. Time to hit confirm and watch the new customers roll in. We are Australia’s digital marketing agency for small businesses and startups. We provide an ROI driven service to our clients. We are especially dedicated to our Business Startup, Social Media Marketing, Perth and Search Engine Optimisation packages.